↑ 1.0 1.1 "Environmental Allergies: Symptoms". NIAID. April 22, 2015. Archived from the original on 18 June 2015. สืบค้นเมื่อ 19 June 2015. ↑ 2.00 2.01 2.02 2.03 2.04 2.05 2.06 2.07 2.08 2.09 2.10 Wheatley, LM; Togias, A (29 January 2015). "Clinical practice. Allergic rhinitis". The New England Journal of Medicine. 372 (5): 456–63. doi:10.1056/NEJMcp1412282. PMC 4324099. PMID 25629743. ↑ 3.0 3.1 3.2 3.3 3.4 3.5 3.6 3.7 "Cause of Environmental Allergies". NIAID. April 22, 2015. Archived from the original on 17 June 2015. สืบค้นเมื่อ 17 June 2015. ↑ 4.0 4.1 4.2 "Environmental Allergies: Diagnosis". NIAID. May 12, 2015. Archived from the original on 17 June 2015. สืบค้นเมื่อ 19 June 2015. ↑ 5.0 5.1 "Environmental Allergies: Treatments". NIAID. April 22, 2015. Archived from the original on 17 June 2015. สืบค้นเมื่อ 17 June 2015. 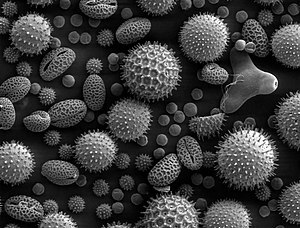 ↑ 6.0 6.1 6.2 6.3 6.4 "Immunotherapy for Environmental Allergies". NIAID. May 12, 2015. Archived from the original on 17 June 2015. สืบค้นเมื่อ 19 June 2015. ↑ 7.0 7.1 Dykewicz MS, Hamilos DL (February 2010). "Rhinitis and sinusitis". The Journal of Allergy and Clinical Immunology. 125 (2 Suppl 2): S103–15. doi:10.1016/j.jaci.2009.12.989. PMID 20176255. ↑ 8.0 8.1 เบญจพลพิทักษ์, ส. (2018). โรคภูมิแพ้ในเด็ก ตอนที่ 1. [online] สมาคมโรคภูมิแพ้ โรคหืด และวิทยาภูมิคุ้มกันแห่งประเทศไทย. Available at: http://www.allergy.or.th/2016/resources_expert_detail.php?id=92 [Accessed 20 Jan. 2018]. ↑ 9.0 9.1 Fireman, Philip (2002). Pediatric otolaryngology vol 2 (4th ed.). Philadelphia, Pa.: W. B. Saunders. p. 1065. ISBN 9789997619846. ↑ Colgan, Richard (2009). Advice to the young physician on the art of medicine. New York: Springer. p. 31. ISBN 9781441910349. Archived from the original on 2017-09-08. ↑ Justin Parkinson (1 July 2014). "John Bostock: The man who 'discovered' hay fever". BBC News Magazine. Archived from the original on 31 July 2015. สืบค้นเมื่อ 19 June 2015. ↑ "Dr. Marshall Hall on Diseases of the Respiratory System; III. Hay Asthma". The Lancet: 245. May 19, 1838. doi:10.1016/S0140-6736(02)95895-2. With respect to what is termed the exciting cause of the disease, since the attention of the public has been turned to the subject an idea has very generally prevailed, that it is produced by the effluvium from new hay, and it has hence obtained the popular name of hay fever. [...] the effluvium from hay has no connection with the disease. ↑ History of Allergy. Karger Medical and Scientific Publishers. 2014. p. 62. ISBN 9783318021950. Archived from the original on 2016-06-10. หน้านี้แก้ไขล่าสุดเมื่อวันที่ 16 มีนาคม 2562 เวลา 02:04 น.